One thing commercial and residential buildings have in common is the need for chimneys to release gases produced by the heating system and exhaust pipes to allow for the escape of gases produced by the plumbing system. In both cases, these are weak spots in the roof where the pipes extrude. Fortunately, there are modular systems available to seal such applications. The “boot” which provides a direct seal will last for 20-30 years, but needs to be replaced on older buildings. More importantly, the tar sealant which secures the boot against the exhaust vent needs to be inspected annually and replaced as needed. Flat roofs are, for the most part, indestructible. That is assuming they have the proper maintenance performed over the years. 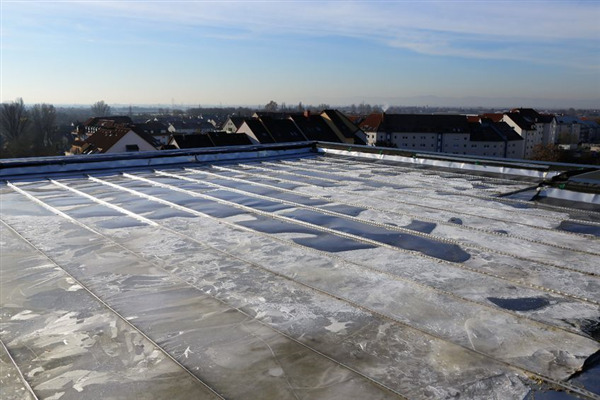 When a flat roof is left unattended for years at a time, problems can and will arise. The gravel needs to be spread out every year, because ice and snow, winds and rain, will displace the gravel throughout the year. That gravel is there for a reason, it protects the roofing material. To the layman, the roofing material seems to be rubber but it is in fact an eco-friendly synthetic material which will last for the life of the building if properly maintained. On occasion, exceptionally large hail storms happen, or a tree limb can fall. Hopefully, your insurance will cover such a disaster effect but regardless of how it is covered financially the roof has to be replaced. Since you already have an established relationship with a professional roofing service for routine maintenance, it's good to know the same company can install a new roof according to your needs.